Learn all about using the built-in cameras. You can use the cameras to take pictures and videos. 1. Open camera. Click Camera icon. To quickly get to the camera, touch Camera icon on the Lock screen and swipe up. 2. Choose a photo mode. Click , then choose to shoot standard, square-format, or full screen photos. 1. Take a photo. Aim your camera at the subject and click. 2. Zoom in or out. The dual cameras capture full-resolution video and stills at 1x and 2x zoom. To quickly switch, toggle or you can also pinch the screen to zoom in and out. 3. Turn the flash on or off. Click, then click On or Off. When you click Auto, your phone will automatically detect lighting conditions and determine if flash is necessary. When you click Fill Light, your phone will use the built-in flash as the fill light. 4. Turn HDR on or off. Click, then click On, Off or Auto. When HDR (high dynamic range) is on, photos take multiple exposures of the same scene and then combine them to create a better looking, more detailed image. 5. Turn Depth Effect on for a photo. Click on the top of the screen. 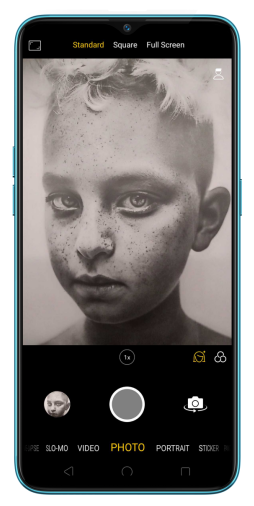 Depth Effect blurs the background while keeps the face in the foreground perfectly focused. 6. Turn on super vivid mode. 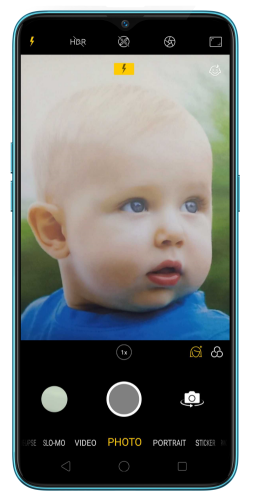 Click on the camera will set color enhancement to vivid and make colors of your photo more striking. 7. Use the capture timer. Capture timer gives you time to get in the picture. Click, then click 3s or 10s. Click Tap if you want to take photos by tapping on the screen. 8. Use Beauty Mode. 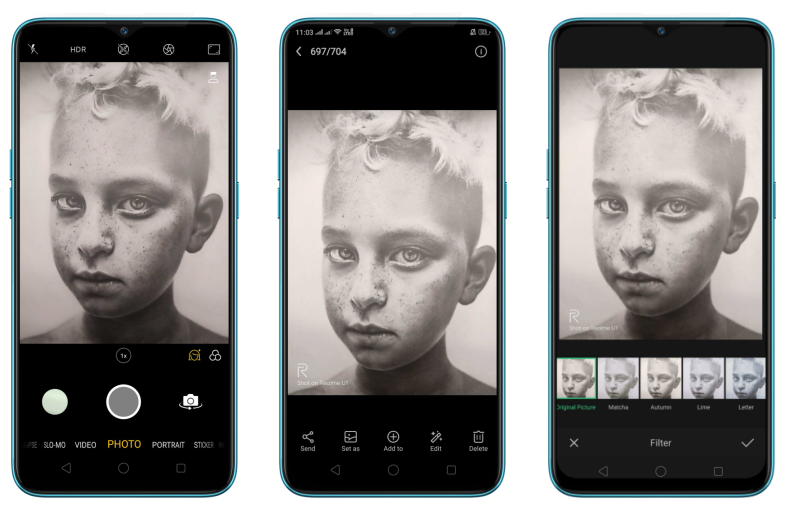 Click on the built-in beauty filter will automatically adjust the skin tone, enhance facial features, and make other minor changes to your appearance. The camera offers six beauty levels. 9. Add a filter. You can apply a filter before you take a photo. 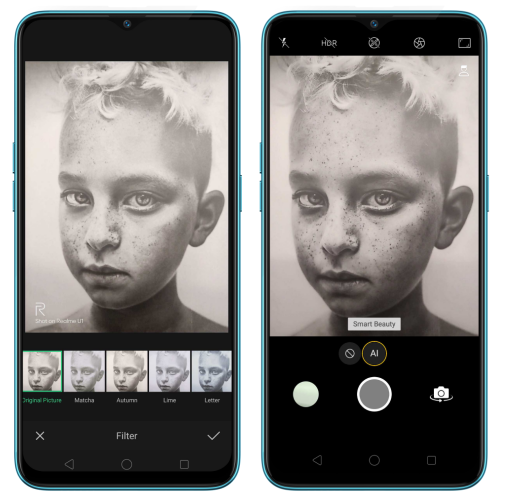 Click FILTER, then you'll see a serious of filter options, with each one showing a preview of what it will look like when applied to your photo. Click the filter you want to use. Switch to ORIGINAL to remove the filter. 10. Add an AR sticker. Use stickers to decorate your photo. Choose STICKER, click , then choose an AR sticker. 1. 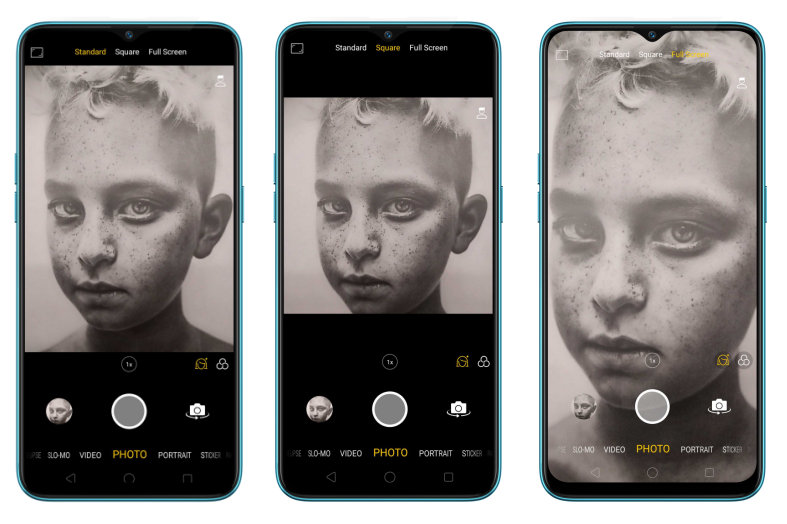 First, choose the "Pano" option with the rear cameras, click the Shutter button, then move the phone slowly and steadily across the subject you want to capture. Click the button again when you've got your full photo. 2. With the front camera, click the Shutter button and you'll hear a "Ding" sound. Rotate the phone left or right until the phone sounds again. The photo will be taken automatically. 3. Use Expert mode. Expert Mode allows you to take more professional-looking photos. Choose EXPERT, then you can adjust camera's white balance, exposure compensation, ISO, shutter speed, and more. 4. Take Burst shots. Touch and hold the Shutter button, and you'll see an onscreen count rapidly rise, which shows the number of photos you're taking. Lift your finger to stop. To select the photos you want to keep, click Gallery, click , select the photos, then click Done. 1. To switch to the front-facing camera, click in the lower-right corner of the screen. 2. Turn the flash on. Click, then click On. A white screen at full brightness is used as front-facing flash. 3. Turn HDR on or off. Click , then click On, Off or Auto. When HDR (high dynamic range) is on, photos take multiple exposures of the same scene and then combine them to create a better looking, more detailed image. 4. Choose a photo mode. Click, then choose to shoot standard, square-format, or full screen photos. 5. 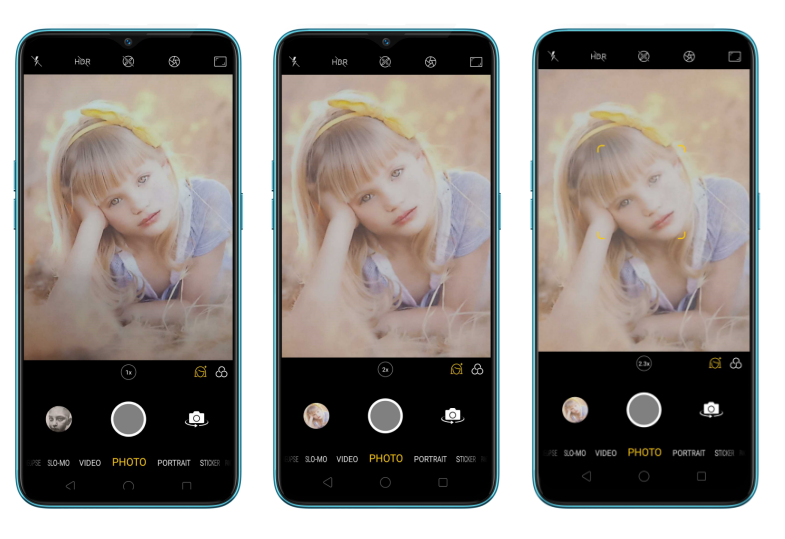 Use Beauty Mode.The built-in beauty filter will automatically adjust the skin tone, enhance facial features, and make other minor changes to your appearance. The camera offers six beauty levels. 6. Add an AR sticker. Use stickers to decorate your photo. Choose STICKER, click , then choose an AR sticker. 7. Turn Depth Effect on for a photo. Click on the top of the screen. 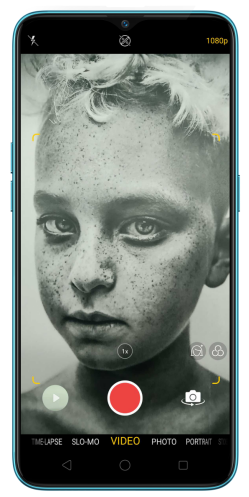 Depth Effect blurs the background while keeps the face in the foreground perfectly focused. 8. Turn on super vivid mode. Click and the camera will set color enhancement to vivid and make colors of your photo more striking. 9. Use the capture timer. Capture timer gives you time to get in the picture. Click , then click 3s or 10s. Click Tap if you want to take photos by tapping on the screen. 10. Take a panorama photo. Choose PANO. Click the Shutter button and you'll hear a "Ding" sound. Rotate the phone left or right until the phone sounds again. The photo will be taken automatically. 1. With Camera you can shoot video, including time-lapse and 10s short videos. 2. Record a video. Choose Video, then click the Record button, or press either volume button, to start and stop recording. You can choose between 720p, 1080Pvideo, and 4K video.